If so, which country? US only this round, just to keep everything fair with the dollar amounts. 1. It's easy to go nuts in the dollar store, so there is a spending limit. No less then $6 and no more than $12 (before tax). 2. There are fake dollar stores out there. You know the ones, The 99 Cents (and in really itty bitty letters) and up stores. Well, for this swap the store has to be at least 90% of just dollar stuff, there are some stores out there that have a "roped off" section of items that are more than a dollar, but to store has to be almost all dollar items. 3. No going to other stores like Micheals or WalMart and going to their dollar section. The store has to be at least 90% dollar stuff. 4. No thrift stores. I know I know, but they are so wonderful! I thought a while about this and I think it would be fun to just keep to the dollar store. 5. You may use less than 25% of your stash to make your items. Example: thread from your stash to sew something together with fabric you found in a table runner at the dollar store. Your items should absolutely feature what you bought at the dollar store. If this isnt followed it will be reflected in the comments on your feedback. 5. Think outside the box and have fun! I am reserving the right to refuse any crafter who has poor communication and/or late send-outs for previous swaps! -When sending PM's, please include "DSS" in all subjects. -Please post an update in the forum weekly once partners have been assigned. You don't have to write more than your crafting progress (Medium 50%, Small 0%) if you don't want to. People who post weekly are less likely to flake, and no one likes flakers! Also, talk to your partner! Have fun and make a new friend. -DC#'s must be purchased when you ship. Please PM me with "DSS- Shipped" as the subject and copy the message to your partner. If you will be shipping late, you MUST notify both myself AND your partner. I understand sometimes that darn thing called life gets in the way of crafting, and Id MUCH rather have someone who sends a little late than someone who flakes. -When you receive, please PM me with "DSS - Received" as the subject and copy the message to your partner. -I will set up a gallery once the first person has shipped. Please post pictures when your package arrives. 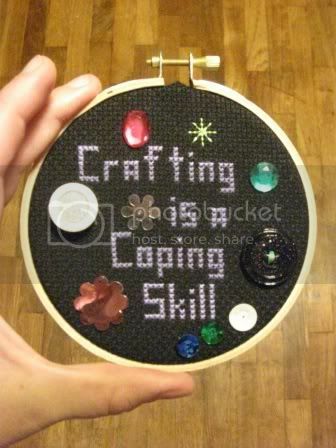 Your partner put a lot of work into crafting for you! They deserve a little recognition!! Your feedback may be delayed if you don't post pictures promptly. If you stated in your questionnaire that you have access to a camera and don't post pictures that will be noted in your feedback. I am soooo hoping for a repeat of this swap once I have been a member for a month! It looks like so much fun! I am a dollar store queen, too. I know I could make some awesome stuff. I have two swap packages to send to Canada. I hope they get through customs quickly so I can join this one. This looks like fun I hope to have a swap slot free again near the end of the signup period and may have to hop in! Oh, PPPPLLLLEEEEAAAASSSSEEEE count me in!!!!!!! sounds like fun, I may have to join this one, I just wnat to finish a few projects first. I will see how much is on my list closer to the end of the sign up period. sss23- all sent and all received. I just wanted to add that at my local dollar store where everythings a dollar they get some really nice yarns once in awhile.